Apple on Wednesday momentarily teased the possibility of a space black Milanese Loop, which would help fill out band options for one of the Apple Watch's most popular colors. 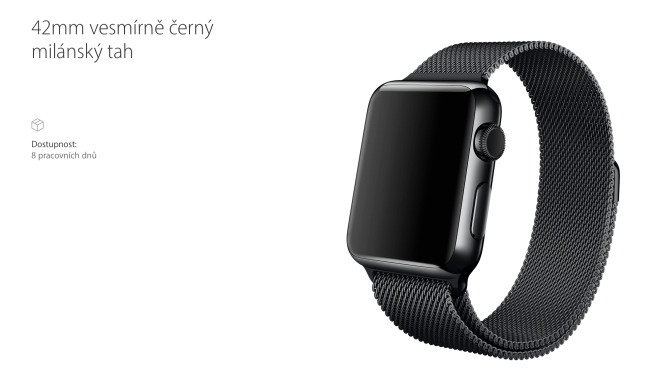 The accessory appeared for a short time on Apple's Czech online store earlier today, and was later spotted at the company's Hungarian and Portugese sites, as noted by 9to5Mac. The Czech page, at least, was lacking a price or an option to buy, but an attached shipping date is said to have pointed to a real launch next week. Space black versions of the Watch have been some of Apple's best-selling models, yet people wanting a matching metal band have so far only been able to pick the Link Bracelet. Last fall Apple added a variety of new customization options for the Apple Watch, including not just bands but additional body colors for Sport models, and a partnership with Hermes offering both leather bands and unique watchfaces. A second-generation Watch could be announced at a March press event. Little has been rumored about features, but the introduction of a new official band this month could suggest that first-gen bands will remain compatible with improved hardware.